We know that many small membership organizations are making New Year’s resolutions to get more active on social media. Organizations everywhere have realized that social media, when approached the right way, can be a great tool to reach out to potential members and engage current ones – especially since more and more people are embracing social media and making it part of their daily lives. Boomers embrace Facebook: For the first time, more than half of all online adults 65 and older (56%) use Facebook. This represents 31% of all seniors. Youths love Instagram: For the first time, roughly half of internet-using young adults ages 18-29 (53%) use Instagram. And half of all Instagram users (49%) use the site daily. LinkedIn + education: For the first time, the share of internet users with college educations using LinkedIn reached 50%. Women dominate Pinterest: 42% of online women now use the platform, compared with just 13% of online men. The report gives detailed demographic information on Facebook, Twitter, Instagram, Pinterest and LinkedIn. Included are detailed tables that break users into groups based on their gender, age, ethnicity, education level and socio-economic status. 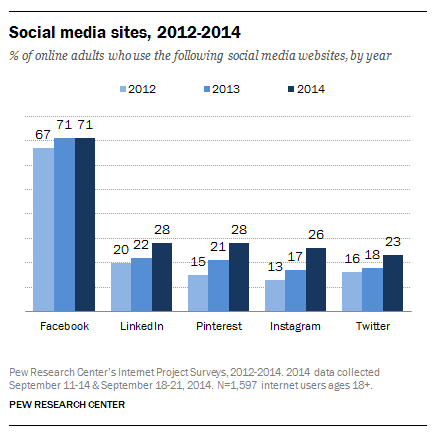 71% of online adults use Facebook, unchanged from August 2013. 56% of internet users ages 65 and older now use Facebook, up from 45% who did so in late 2013 and 35% who did so in late 2012. 28% of online adults use Pinterest, up from the 21% who did so in August 2013. 28% of online adults are LinkedIn users, up from 22% in August 2013. The report makes it clear: social media is on the rise in every demographic. A majority of internet users are now on more than one social media channel, and more people than ever are logging on every day. These findings offer great insight into where different audiences (including your members) like to hang out online. Demographic information in particular can be a great way to figure out what social networks your audience is using. The findings paint a solid picture of the broader internet audience, but taking the effort to survey your own members or supporters can prove to be fruitful when trying to set up or refine a social media strategy for your organization.